Its summer 2003  the summer of Mars. Two space agencies have monumental missions in the works. From Cape Canaveral, two Mars Exploration Rovers (MER)  touted as the most sophisticated robot geologists NASAs $800 million could buy  are on their way, set to arrive on the Red Planet in January (see Geotimes, May 2003). Meanwhile, from Baikonur in Kazakhstan, the European Space Agencys (ESA) Mars Express orbiter, transporting the British-designed and possibly life-detecting Beagle II lander, blasted off aboard a Soyuz-Fregat launcher on June 2. The Mars Express mission, though geared toward biology, has the potential to answer a few geological questions. 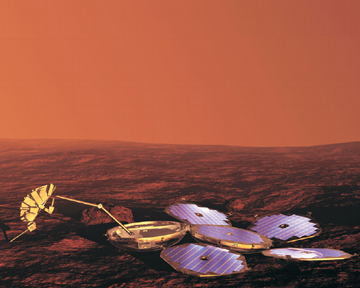 Artists impression of the Beagle-2 lander on the surface of Mars. In addition to looking for signs of past and present life, the European Beagle-2 will investigate the geology of the landing site and monitor weather and climate. Image courtesy of the European Space Agency. In addition to the Beagle II lander, the orbiter carries three less-advertised instruments that will study the geology of the planet: the High Resolution Stereo Camera (HRSC), the Visible and Infrared Mineralogical Mapping Spectrometer (OMEGA) and the Sub-surface Sounding Radar Altimeter (MARSIS). These instruments will image the entire surface of Mars at high resolution, looking at the planets mineralogical and atmospheric composition and the structure of the subsurface. All together, the objectives of the instruments fit within ESAs overall goal  similar to that of NASAs MER geologists  to study both the history of water and habitability on Mars. If all goes well, Express will be ESAs first successful Mars mission. The HRSC and OMEGA instruments are both holdovers from the ill-fated Mars 96 mission, which met its end in the Atlantic. Had the mission arrived at Mars seven years ago, the instruments would have been first on the scene and would have provided initial results. Since then, NASA has sent two very successful geological missions with comparable instruments  Mars Global Surveyor and Mars 2001 Odyssey. These recent successes may limit the opportunities for Express to make new discoveries. Still, enthusiasm for the European mission remains high. We are addressing a series of noble scientific objectives, says Agustin Chicarro, Mars Express project scientist at ESA. He and his colleagues hope to help answer the big questions about water and life, to find clues as to why the north of the planet is so smooth and the south so rugged, and to study whether active volcanoes exist on Mars today. We should also find out about the minerals in the rocks and the composition of the atmosphere in greater detail than ever before, Chicarro says. The combination of ESAs datasets with NASAs could yield even greater detail of the martian landscape. HRSC images will be joining images from the Mars Orbiter Camera onboard NASAs Mars Global Surveyor. Since July of 1997, the orbiter camera has been taking high-resolution pictures of a large catalogue of interesting sights  including layered terrains, gulleys, glacial moraines and dust devils. The HRSC high-resolution, 3D and stereo images will add to this existing collection and to the cache of 3-D landscapes produced by digitally combining orbiter images with topographical data from NASAs Mars Orbiter Laser Altimeter (MOLA). In exploring the mineralogical composition of Mars surface, OMEGA joins both of NASAs thermal infrared instruments. They have provided rich data in the thermal infrared at similar resolutions to OMEGA, but the ESA instrument looks at the visible and near-infrared spectral region. What the geologists are looking for remains the same: We want to know the iron content of the surface, the water content of the rocks and clay minerals and the abundance of non-silicate materials such as carbonates and nitrates, says Jean-Pierre Bibring, OMEGAs principal investigator. Although Mars Express largely relies on old technologies, in many ways replicating past experiments, it can only contribute to an ever-growing body of knowledge about the early history of Mars and its water, and the processes that shape the planet today.